Having the right equipment and using your time wisely means that your home stays neat without using up all your free time. A good handheld vacuum cleaner is an important tool in keeping your home clean. They can be especially helpful in homes with pets and children. There are many different options when it comes to handheld vacuum cleaners. You can use your handheld vacuum for quick cleanups so that you don’t have to drag out your large vacuum every time you need to clean something up. Handheld vacuums are light and can be taken anywhere you need them. The following is a list of the top 10 best handheld vacuums based on consumer report. The Dyson V7 Trigger cord-free handheld vacuum comes with a mini motorized tool, a combination tool, and a crevice tool. This lightweight vacuum is easy to use and allows you to clean up many different types of messes around the home with little time spent on the cleanup process. 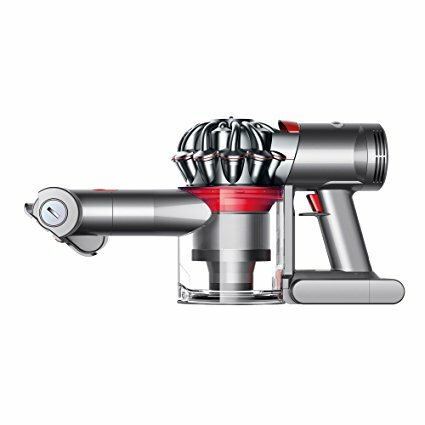 This handheld vacuum from Dyson comes with a 2-year warranty that covers parts and labor. The vacuum has a hygienic dirt ejector that allows you to clean up and empty your dirt collection bin without ever having to touch the dirt and dust. 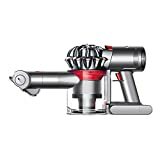 The unit has the Dyson V7 motor for long lasting power. It can be used for up to 30 minutes on one charge. The BLACK+DECKER handheld vacuum cleaner has a long battery life and can hold a charge when unplugged for up to 18 months. This vacuum is lightweight and has a comfortable handle for easy usage around your home. The included lithium integral batteries have a smart charge function that only charges the unit when it’s needed. This vacuum is a great option for those looking for an affordable and versatile handheld vacuum cleaner. The dirt cup is easy to remove and can be rinsed out, along with the included filter. The vacuum comes with an on-board crevice tool and brush tool so that you can clean many different areas. The BLACK+DECKER cordless handheld vacuum is lightweight but still powerful enough to clean up messes around your house. It has lithium technology that is able to provide strong suction so you can quickly vacuum up dirt, dust, and debris. The vacuum has a washable dirt bowl and filter that are easy to remove to clean as needed. This affordable vacuum is ideal for anyone searching for a basic but effective handheld vacuum. It comes with a charging base that can be mounted to the wall to keep the unit out of your way but always available. The translucent dirt bowl lets you know when it needs to be emptied. 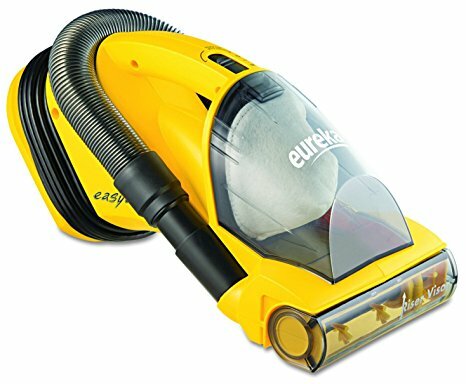 The Eureka EasyClean lightweight handheld vacuum weighs less than 5 pounds. This unit works well for inside the home and can also be used to clean out your vehicle. It has a motorized brush that can be turned on or off depending on the surface you’re cleaning. 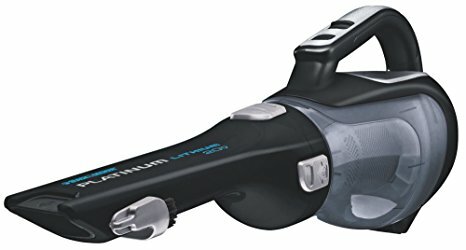 This vacuum from Eureka has two motors, one for the brush and one for the entire vacuum. It comes with a 20 foot cord that allows you to reach nearly all areas of a room. The vacuum has an integrated filter and a dust bin that is easy to remove so you can empty it as needed. It comes with a 1-year warranty from the manufacturer. 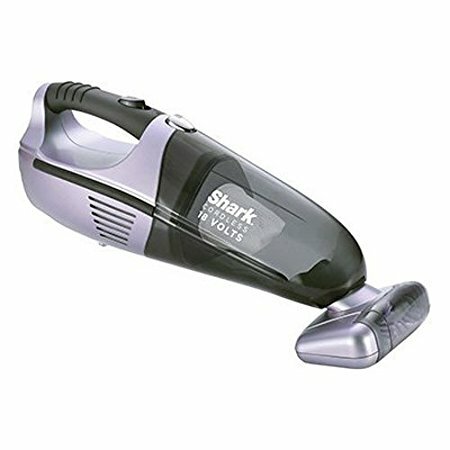 The Shark Cordless Pet Perfect II was designed specifically to clean up pet hair and messes in your home. This unit picks up pet hair from carpets, rugs, furniture, and hard surfaces. 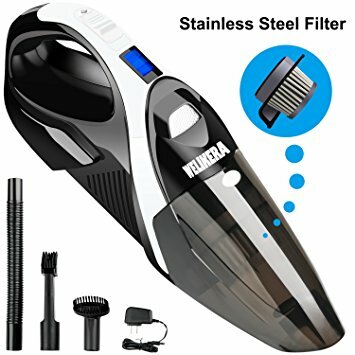 It has a motorized brush attachment that can be used to remove pet hair from all types of surfaces and it also works well for basic cleaning of carpets and stairs. This handheld vacuum from Shark also comes with a crevice tool for small spaces and a dusting brush to pick up fine particles from surfaces. The included charging unit can be mounted on the wall or placed on the floor or another surface in your home for convenience when cleaning. 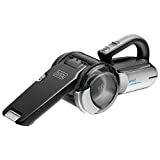 The BISSELL Pet Hair Eraser Cordless handheld vacuum can be used in the home or inside your car. This vacuum has a powerful motor and a motorized foot that is designed to pick up tough pet hair. The unit comes with a crevice tool for cleaning tight spaces and upholstery tool so you can easily clean your car or upholstery in your home. 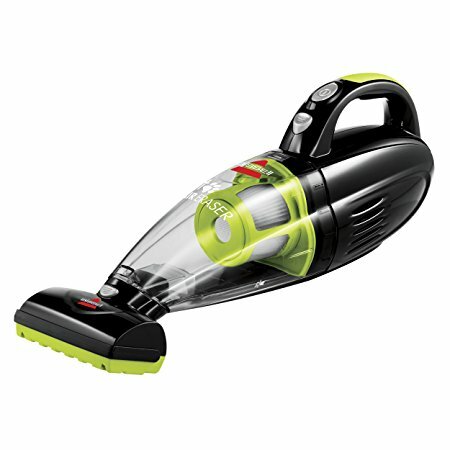 This vacuum from BISSELL has a dual action filtration system that is designed to capture all dirt, dust, and debris. The filtration system also works to extend the life of the filter and make cleaning out the dirt bin and filter quick and easy. 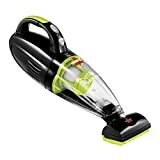 The BLACK+DECKER BDH2000PL MAX pivot vacuum has lithium technology for plenty of suction to clean nearly any type of mess around your home. The vacuum has a unique pivoting nozzle that can be moved around to clean under furniture, in upholstery crevices, or in other tight places. It has a wide mouth design that allows it to pick up large objects. 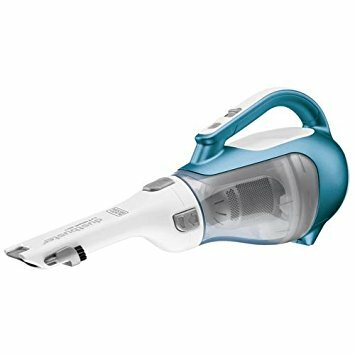 This vacuum from BLACK+DECKER has cyclonic action that works to spin dust and debris away from the filter to give you long lasting suction. The 3-stage filtration system and powerful motor work hard to remove even the smallest pieces of dirt for fade-free power while cleaning. The Dust Buster Cordless vacuum can complete a charge within 3-4 hours. This compact handheld vacuum has a long-lasting lithium ion battery that can last 25 minutes on one charge. The unit has a removable stainless steel filter that can be washed as needed. 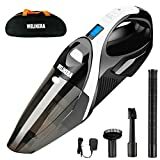 This handheld vacuum cleaner has a built-in LED light that helps you better clean tight spaces in your home or in your car. It has powerful cyclonic suction that allows it to pick up dirt, dust, and debris for quick cleanup. It comes with several attachments that help you clean carpets, rugs, upholstery, and hard surfaces around your home. 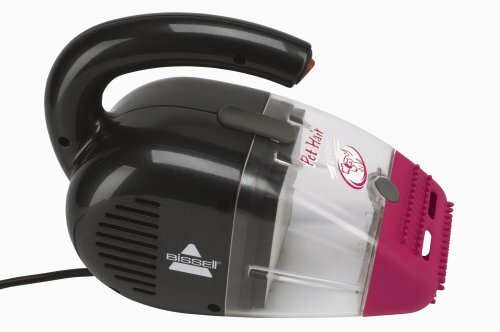 The Bissell Pet Hair Eraser handheld vacuum is compact and affordable. This vacuum comes with a 16 foot power cord so that you can clean many size rooms without having to unplug the unit and move it around. It has a special rubberized nozzle that is specially designed to pick up pet hair from rugs, carpets, upholstery, and other surfaces. 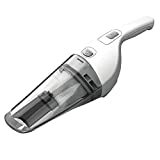 This small vacuum from Bissell uses a cyclonic style cleaning system for powerful suction that doesn’t fade during use. It comes with 2 different nozzles for completing different cleaning jobs. The vacuum has a multi-layer filtration system that helps and hole to remove even the smallest pieces of dust and debris. The BLACK+DECKER CHV1410L 16V cordless hand vacuum has a long-lasting lithium battery that is has a long life for many hours of usage. This handheld vacuum has a swivel nozzle that allows you to clean in many hard-to-reach spaces like under furniture or in tight corners. This vacuum from BLACK+DECKER has smart charging technology that prevents it from overcharging, making for a longer battery life. The cyclonic action works to keep the filter clear so that you can clean for longer periods of time. The filter and bowl are both removable and washable. The included dirt bowl is translucent so you can see when it needs to be emptied. Most handheld vacuums come with a charging unit that can be mounted to your wall. This helps you keep up with your vacuum and know that it’s always charged when you need it. Many also come with various attachments and accessories for different cleaning functions. There are attachments to clean small spaces, pick up pet hair, or clean upholstery. One of the best things about a handheld vacuum is that you can even teach your kids to use it so they can help clean up around the home. When shopping for a handheld vacuum, it can be very helpful to read online consumer reviews. These reviews can provide you with helpful information that you can’t get from other sources. Handheld vacuums come in a wide range of prices, including some pricey ones that have a lot features. But there are many affordable options that work well without breaking your budget. Read up on the features of the options you’re considering to find the one that best meets your cleaning needs.